Cozy Cottage Na Jamaica Rural. Ricos na luz do sol, cor, sabor, e calor. A casa é na sua maioria de madeira, com uma base de concreto com dois quartos, uma cozinha e casa de banho. Há um pouco de privacidade como a casa é na parte de trás do imóvel e muita sombra das enormes árvores de manga, amêndoas, limão, ameixa, niesberry, maçã jamaicano e abacate. É mais ou menos uma hora de Kingston, a 45 minutos de Ocho Rios ou três horas de Montego Bay. A praia mais próxima, em Long Beach, é isolada e sereno. Nesta região também existem cachoeiras espetaculares que você deve caminhar pela selva com um guia de encontrar. Ao anoitecer, os grilos e sapos começam seu coro e por rouxinóis dia e pombas carregam a melodia ambiente. Não há realmente qualquer animais selvagens perigosos aqui - apenas burros, cabras, mangusto ... este é o verdadeiro jamaica. Desfrute de alimento não-industrial fresco. Este é jamaica inalterado e desconectado. Rico em luz do sol, cor, sabor e calor. O banheiro é no andar principal e inclui um vaso sanitário e chuveiro. if you want to completely unwind and relax with amazing people, thats your place to be! we had a wonderful time with Gary and his friends and familiy, and enjoyed the nature and the quiet to the max! Thanks for everything guys! You are most welcome! It was a pleasure to share some time and memories in Jamaica. Come back and visit anytime. We stayed in this rural and rustic cabin. This was an authentic Jamaican experience. The vegetation were prolific with many different fruit bearing trees. Gary and his brother gave us much of their time. Gary cooked our delicious meals, which had several items harvested right out of the garden or forest for the meal. We encountered some tropical rain storms. We will always treasure our stay and the kindness, that was shown us. Staying at tonys yard was an amazing experience and everything we searched for. Gary and Tony are very friendly people and they were willing to help us all the time. The property is beautiful with lot of fruit trees and some cute cats. The nature out there is amazing and you are far away from tourism. It is a really quite and peaceful place. Gary is a fantastic cook, so you can have some real jamaican food. There is a long beach with great waves.Only a few people passed by, so it was like being alone with the sea. The atmosphere in Nutfield is very peaceful and you are surrounded by nature. We've had a great time and experienced the real jamaica. Overall my experience was amazing. Being skeptical of Jamaica's rumored danger I was pleasantly surprised to feel very comfortable in this cabin. Literally in the middle of the jungle, with spectacular ocean views I felt very relaxed and easily escaped the hustle and bustle of everyday life. The people are very kind and Gary's cooking is unique and exquisite. You can not get anything better than a meal cooked from veggies that were picked minutes before. Although rustic, the property was clean and maintained. The beach was a short drive away and easily reachable by taxi (only 5 bucks!). However I enjoyed walking on foot and getting a feel for Jamaican life. 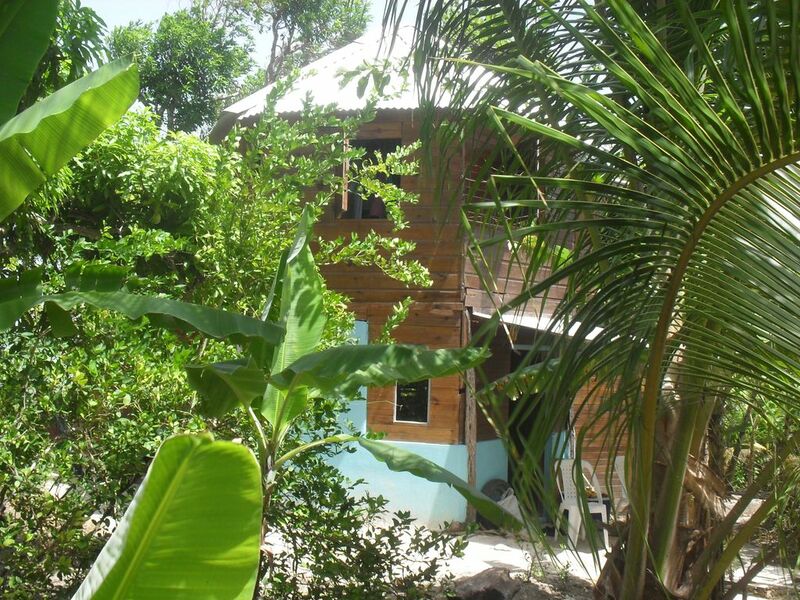 This is a fantastic cabin if you want to experience the real, rural Jamaica. It's miles from tourists. Every tree on the property is a fruit tree. The neighbors stroll over to hang out, make sure you're well, and bring fresh fruit from other trees. Glorious weather, this shack is in a remote, friendly village perched on a verdant mountain in banana groves overlooking Robins Bay. Tony introduced us to Narval, a taxi driver who we hired to drive us around. He was a good driver and a fun friend for the week. The cabin is at least a 20 minute drive from the beach, so that may not be great if you're looking for a beach holiday. The cabin was more rustic than we expected, with no hot water. We suggested they get a refrigerator, which they plan to do. Tip: make sure Gary fixes several dishes including vegetables with each meal. He can do some great vegetable dishes. We loved the "breadfruit". Overall, it was unforgettable and unique, but may not be for everyone.